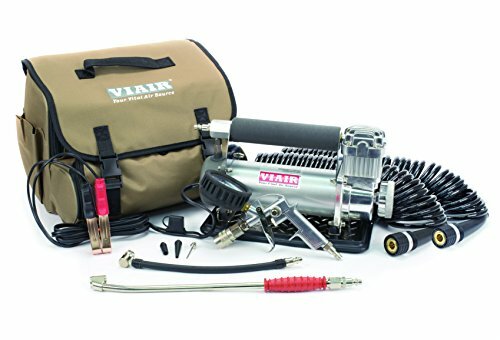 The Viair 450P is hands down the best RV tire air compressor on the market. It will be the last RV tire air compressor that you will ever buy. Buy one for yourself before its too late. In week 9 of our journey, we attempted to top off the air in our trailer tires to the 110 PSI they required (it was at 103 PSI). The tire air pump at the commercial gas station turned out to not be up to the job though and we lost more air then we put in and ended up with 85 PSI in the tire. That is when we learned that the average gas station tire air pumps are only ratesd to around 80-90 PSI. Luckily for us, there was a commercial tire only 2 blocks away with room to maneuver our fifth wheel close enough to their air compressor. We lucked out that day but that is when I began researching to find the best portable RV tire inflator. I didn't want to feel helpless like that again over such an easy problem. It didn’t take long to discover that the Viair 450P-RV was the compressor I wanted. We had always owned the cheap air compressors from Walmart before and that wasn’t what I wanted now. Cheap plastic devices that plugged into a cigarette lighter, took forever to fill up the tire, and over-heated easily. The 450P-RV was none of that. It has an automatic shutoff feature and gas station style air gun attachment with a gauge that allows you to easily top off all your tires without overheating the RV tire air compressor. Did I mention that it has a max pressure of 150 PSI? It will easily handle any tire I need to fill now or in the future. It only had one problem, the cost. We were used to spending $50 on crappy Walmart tire inflators so we were not able to ignore the difference in cost for a 12-volt heavy duty air compressor like the Viair 450P-RV. We finally made the smart move and purchased the Viair 450P-RV after Rae spent the better part of two hours driving around southern Louisiana attempting to find a working gas station tire air pump. The piece of mind the RV tire air compressor has given us is worth way more than the cost of the compressor. The time we save topping off the tires is nothing to scoff at either. This is the same compressor we bought last year. When we got our new Solitude I quickly realised only my shop air compressor was the only one I had big enough to be able to inflate the tires to 110psi. Brought this compressor and have used it once so far. Found that you have to use the screw on value connector when filling the tires as you can’t hold the push on connector tight enough when needing 110psi. Great choice!